Need 5 bedrooms? 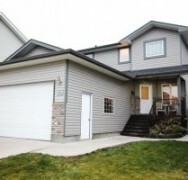 This 1,643 sq.ft 2 storey not only has 5 bedrooms, it also has an office/den on the main level & an open bonus room upstairs. All new vinyl plank flooring throughout the main level. Upon entry you will see an archway leading to the open plan main living areas including kitchen with maple cabinets, island with breakfast bar ledge, tile back splash, corner pantry & all newer appliances including a gas stove. The living room features a corner gas fireplace & large window. A garden door from the dining area leads to the 16'x8' mostly covered deck with gas line for BBQ. Also on the main level is a laundry room, 2 piece bathroom & access to the double attached garage. 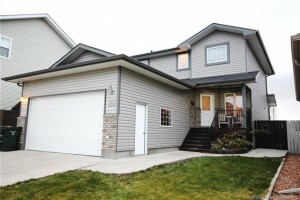 There are 3 bedrooms upstairs including the master with a 4-piece ensuite, main 4-piece bathroom & the bonus room. The fully finished basement offers a family room wired for surround sound, large 4th bedroom with walk-in closet, 5th bedroom & 3 piece bathroom with tile surround shower. To view pictures and for more information, click here.